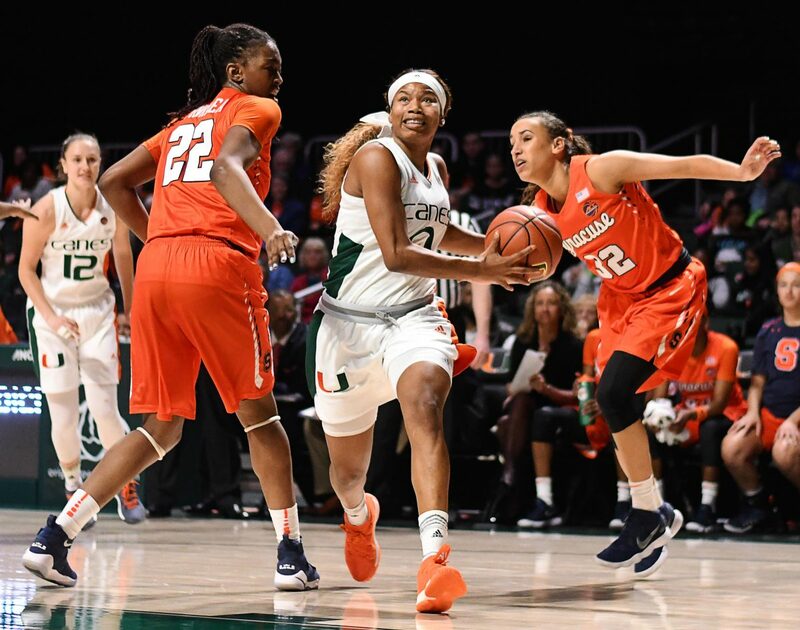 Behind stellar performances by two of their seniors, the Miami Hurricanes thwarted Syracuse’s comeback attempts and picked up a 72-67 victory Thursday night in Coral Gables. The Hurricanes picked up the 750th win in their history. Senior forward/center Erykah Davenport finished with 21 points and 13 rebounds – five came on offense – to lead the Canes (13-6, 3-3 ACC). The captain from Decatur, Georgia, recorded her eighth career double-double. Six of them have come this season. Off the bench for the Hurricanes, senior forward Keyanna “Keke” Harris scored a season-high 16 points and shot a perfect 5-5 from the field in the first half. Miami’s bench outscored Syracuse’s 26-8. Harris has changed her leadership approach this season. “I’m known for talking, so I felt like instead of talking more, to commit to doing and once I do it, then I’ll be able to talk,” she said. Syracuse put up a competitive effort. Guard Tiana Mangakahia and forward Miranda Drummond each finished with 17 points and nine rebounds. Mangakahia also dished out a game-high 14 assists – she leads the NCAA in assists per game – despite also totaling 10 turnovers. A 17-3 run gave the Hurricanes an 11-point lead going into halftime. Two Syracuse (14-5, 2-4 ACC) runs in the third quarter, including an 8-0 spurt, cut Miami’s lead to 55-51 going into the final period. Miami regained its focus and held onto the lead for the remainder of the contest. Two free-throws by freshman Mykea Gray gave UM a 69-63 lead with 31 seconds left. “Syracuse is great, and it turns out Miami is too, so that’s a pretty good win for us,” Meier said. UM next travels to take on Boston College (6-12, 1-4 ACC). Tip-off is set for a 1 p.m. start Jan. 21.